Diehl would ‘welcome’ Trump. Baker? Not so much. This is the 2018 GOP ticket in Mass. 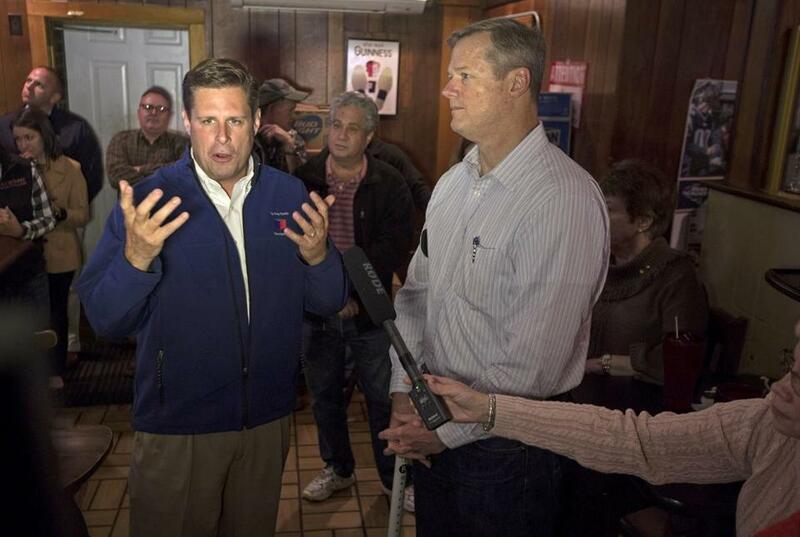 Geoff Diehl (left) campaigned with Governor Charlie Baker in 2015. Governor Charlie Baker, a popular Republican in a deeply blue state, has walked a calculated line when it comes to President Trump, making it clear he didn’t vote for him in 2016 and distancing himself from the White House’s more divisive policies and rhetoric. Geoff Diehl, the winner of last week’s primary to take on US Senator Elizabeth Warren, cochaired Trump’s presidential campaign in Massachusetts, said he would welcome the president campaigning for him, and expressed support for Trump even at controversial moments — for instance, defending the president when two Trump associates received felony convictions last month. Welcome to the top of the state’s 2018 Republican ticket. When asked this month whether he would endorse Diehl, Baker failed to mention his fellow Republican by name: “I’ve endorsed the ticket, which I said I was going to do months ago,” said Baker. He went on to emphasize that he’s focused on his own campaign and helping Republican candidates who can advance his legislative agenda on Beacon Hill. At best, the unlikely pairing means more awkward moments ahead for Baker, who early polls showed had a large lead over any potential Democratic opponent. At worst, the presence of a Trump enthusiast on the GOP ticket could cause Democrats and independents who’ve supported Baker in the past — and whom he needs to win reelection — to reject the whole GOP ticket. Conservative Republicans, miffed by Baker’s moderate maneuvering, could also leave the ballot blank for governor. Democrats — particularly the party’s nominee for governor, Jay Gonzalez — sense in Diehl’s primary victory a fresh opportunity to tie Baker to the unpopular president. “Geoff Diehl is 100 percent unabashedly supporting Donald Trump” and his agenda, Gonzalez said Thursday at a press conference devoted to slamming Baker for backing Diehl and not standing up to Trump enough. Democrats up and down the party ranks, including Warren, have joined in the Diehl-focused barrage. Baker “wants to send people to Washington who will help advance the agenda of Donald Trump; that’s exactly what’s happening here,” Warren told reporters after a campaign event Wednesday. Also in the US Senate race is Shiva Ayyadurai, who began running in the Republican primary but shifted to an independent candidacy last year. Baker’s campaign said they are confident that voters know the governor’s record when it comes to Trump, that Democratic and unenrolled voters view him as separate from the national Republican Party. “Governor Baker did not vote for President Trump, has consistently disagreed with and advocated against federal policies misaligned with the best interests of the Commonwealth on issues like health care, immigration and climate change, and remains focused on running his own campaign by communicating directly with Massachusetts’ voters about his administration’s bipartisan record of results,” said Terry MacCormack, a Baker campaign spokesman, in an e-mail. Early polls bolster that view, showing even diehard Democratic primary voters feel warmly toward the Republican incumbent. In a July WBUR/MassInc poll of the Seventh Congressional District — one of the most liberal districts in the country — 62 percent of Democratic primary voters said they viewed Baker favorably. The Trump factor was always going to be an unavoidable issue in the race given the way his presidency has inflamed partisan divides around the country and captured the national consciousness. And Diehl’s unapologetic embrace of the president injects national politics into the general election even more, analysts say. With an affable nature and penchant for rolled-up shirtsleeves, Diehl doesn’t project a very Trumpian temperament. But he backs many of the president’s issues, including expanding a wall along the border with Mexico, enacting tougher immigration laws, and repealing the Affordable Care Act. He said in an interview after his primary victory he would welcome Trump’s support if the president decided to campaign for him, noting how a trio of Trump supporters — Maine Governor Paul R. LePage, former Trump economic adviser Stephen Moore, and former GOP presidential candidate Herman Cain — had all campaigned for him during the primary. He has responded to Gonzalez’s attacks, however, by saying he will call out Trump when he thinks the president’s wrong, as he did when the administration proposed scrapping the state and local federal tax deduction. Baker, on the other hand, has urged GOP leaders in Washington not to scrap the health care law, and he reversed plans to send the Massachusetts National Guard to the Mexican border after news broke about the administration’s family separation policy. The Baker-Diehl pairing is creating its own tensions for voters on the right. Conservative activist Mary Lou Daxland said she hasn’t spoken to a single person who voted for Scott Lively, Baker’s primary opponent, and who is also planning to vote for Baker in November. Her allies are turned off by the moderate governor’s efforts to wrest party power away from conservative activists in the state, by his “liberal” stands on such issues as gun control and abortion, and his criticism of Trump, she said. Lively, a conservative, pro-Trump, antigay pastor from Springfield, isn’t showing any inclination to help heal this GOP rift. On Sept. 10 he sent supporters an e-mail — subject line: “RINO Hunting Anyone?” — asking whether he should work to defeat Baker in November and implying that he could ask them to leave the line blank for the governor he characterized as Republican in name only. On Thursday, however, Lively announced he would not “participate in the general election,” even informally. While he lost, Lively seized 36 percent of the vote in the primary — a total of more than 98,000 votes, more than double the number that made up Baker’s 2014 margin of victory over Democratic opponent Martha Coakley. As beloved as he is by state conservatives, Diehl and his campaign said they are fully on board with Baker.